Deliver exceptional results from your IT department using Agile approaches. Agile methodologies and practices have been proven over the past two decades to increase the relevance, quality, flexibility and business value of software solutions. The IT departments of many large and successful organizations (including Google, Microsoft, Yahoo! and BT) have all delivered productivity gains through the adoption of Agile approaches. It worked for them, but will it work for you? Everything you want to know about Agile is written specifically to address the challenges of implementing Agile within the unique structures, constraints and culture of your organization. It provides you with the information you need to assess whether Agile is right for your department, to select the Agile methodologies and practices that are best suited to your work, to successfully implement these approaches, and to measure the outcomes. Most importantly, this book gives you strategies for aligning Agile work within the reporting, budgeting, staffing and governance constraints of your organization, which is arguably the biggest challenge. Written for executives, IT department managers and other senior decision makers, this book is equally valuable for IT project managers, team leaders and management consultants who want to deliver successful Agile results. Jamie Lynn Cooke has 21 years' experience as a senior business analyst and solutions consultant, and has worked with over 125 public and private sector organizations throughout Australia, Canada and the US. Jamie has been working with Agile methodologies since 2003, and has written several other books on Agile, including Agile Productivity Unleashed and Agile: An Executive Guide: Real results from IT budgets. 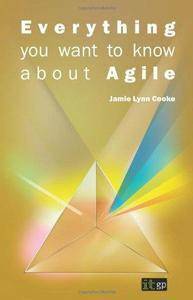 An essential read for anyone wanting to make Agile work in their organization!